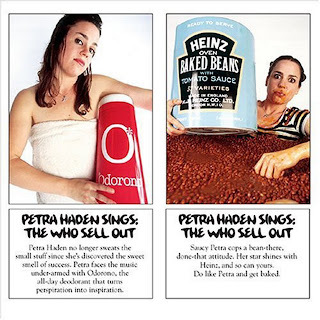 I’ve been a big fan of Petra Haden ever since her home-recorded a cappella version of the entire Who Sells Out album (click the picture to purchase) came out on Bar/None over two years ago. Of course I should have known about her long before that. Apart from being a member of that dog, The Rentals and The Decemberists she’s also an in-demand session musician and vocalist having played and/or sang on dozens of records by artists such as the Foo Fighters, Green Day, Mike Watt, Luscious Jackson, Victoria Williams and Beck. What I’m really digging though is her a cappella work. Now when I say a cappella I don’t mean she’s just singing the words without any music behind her. She does everything: guitars, strings, drums, bass, keyboards; all with just her voice. At first I thought the novelty would wear off pretty quickly but every time I hear it I get this warm happy feeling and repeated listens only leave me more impressed with what she can do with those vocal chords. Plus some of the cheesy cover selections are just too damn fun. She’s also currently streaming a new track on her myspace page. 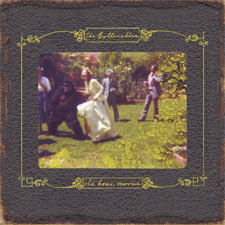 It’s her cover of Japanese pop-noise savant Cornelius’ “Music” from his brand new EP Gum out now on Everloving Records. 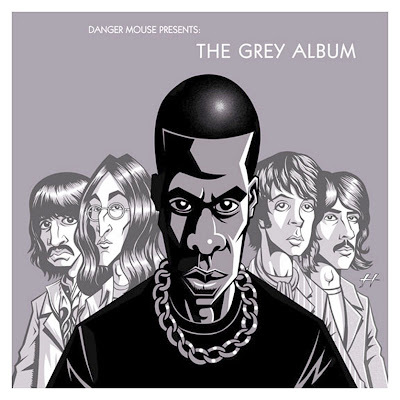 One of the most famous (and controversial) examples of the mashup genre is Danger Mouse‘s “The Grey Album”. Released in early 2004, it layered the a cappella version of Jay-Z’s The Black Album over instrumentals created from unauthorized samples from The Beatles’ self-titled double album more commonly known as The White Album. White + Black = Grey, get it? Needless to say EMI popped a vein slapping cease & desist orders on anyone distributing the limited copies Danger Mouse produced (rumored to be in the neighborhood of 3,000). 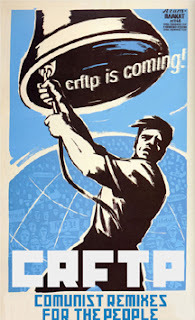 This somewhat defensible protection of EMI’s copyright led to an impressive grass roots movement to distribute the record over the internet led by the folks at Downhill Battle. 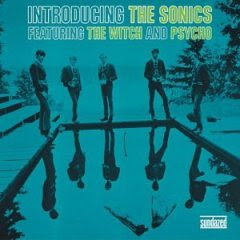 Dubbed “Grey Tuesday”, February 24th, 2004 saw roughly 170 sites hosting the album for download. Estimates range up to 100,000 copies dl’ed that day. Happy to say I’m one of ‘em. Hurray for internet civil disobedience! So those are my two boys. 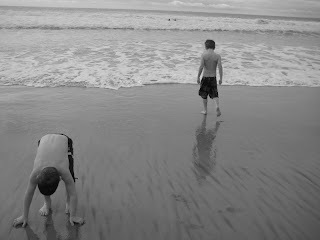 This photo of them frolicking in the Pacific Ocean was taken in late December. We Californians may be wimps when it comes to weather but I gotta bet there aren’t too many folks on the East Coast wearing their bathing suits outside right now. Anyway, it’s time for a bit of shameless self promotion (as if blogging weren’t enough of a self indulgence): I have a regular DJ shift on KALX in Berkeley every other Wednesday from 6 to 9 PM. A regular feature on my show is “Music Picked Out By My Kids” when I play four records that the boys have picked (usually at random) from my record collection. It’s an interesting (and challenging) exercise creating a set that flows nicely without having control over the source material (well, I do pick the tracks). Hope you like it. This could be a regular feature here if folks dig it. Let’s run it up the flagpole and see who salutes shall we?